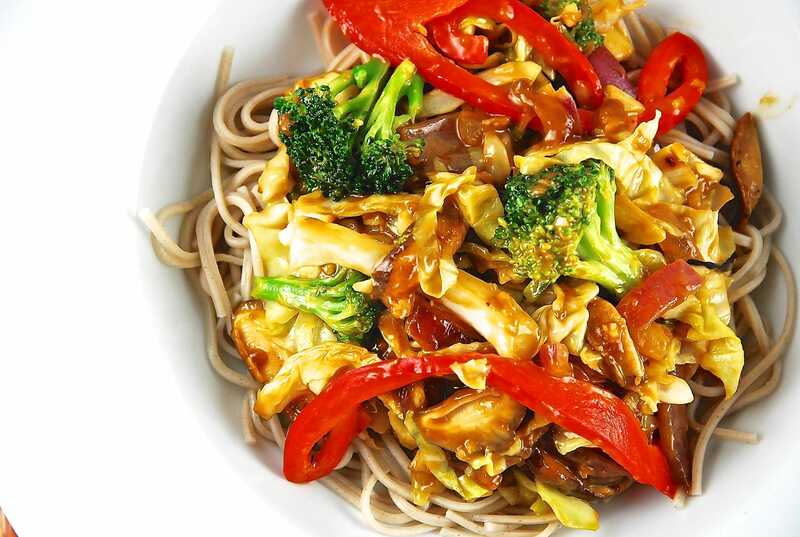 What better way to get in a nice big serving of veggies than to serve them atop noodles with a delicious Asian-style sauce smothering everything! This Savory Vegetable Stir Fry dish has become a family favorite of ours because not only is it healthy and delicious, but it’s a breeze to prepare. Feel free to mix it up with the veggies and toss in whatever you have on hand. It also works great with cauliflower, bok choy, zucchini, carrots, and snap peas. You could also serve this over brown rice or quinoa if preferred, and it reheats brilliantly the next day, so make sure to make some extra for leftovers! A most delicious way to enjoy your veggies, this fantastic, flavorful vegetarian stir fry recipe is simple and always a crowd favorite. Prepares noodles according to package directions and set aside. Heat olive oil in a large, nonstick skillet over medium high heat. Add in onions and garlic, and cook for about 3 minutes. Add in the broccoli, bell pepper, cabbage, mushrooms and ginger. Continue to cook until the vegetables are tender, but not soft and mushy, about 4-5 minutes. Meanwhile, in a large bowl, whisk together the soy sauce, vinegar, sesame oil, peanut butter, red pepper flakes, and cornstarch. Mix well. Pour sauce over vegetables, turn heat to medium, and cook while constantly stirring until sauce thickens, about 3-5 minutes. Toss with prepared noodles and serve.